If you are a Google+ user, you should already have been notified by Google that its social media platform, Google+, will be shutting down imminently. If you have any data in Google+ that you want to keep, Google advises that you should download and save it by March 31st, 2019. 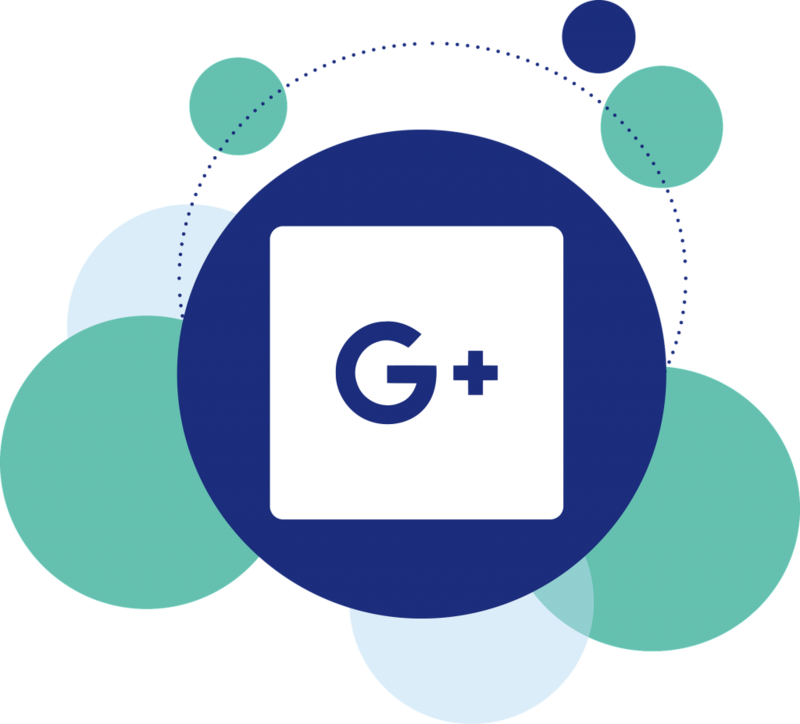 The shuttering of Google+ will commence as of April 2nd 2019. Google has already taken steps to wind up its social media service as you can no longer create new Google+ profiles, pages, communities or events. Google+ comments have also been removed. After April 2nd, Google will begin to remove content from Google+ which will take time to complete, so if you have content, it may still be there for a while. Any sites that use Google+ buttons for login purposes will also cease to function over the coming weeks. In some instances, the Google+ button will be replaced with an ordinary Google button instead. It is, of course, recommended that you no longer use the Google+ widget or button in your website. Also remember that it is only Google+ that is going away so your regular Google account will not be affected. G Suite users will also have new and updated options. If you have any comments or questions about this post, please let us know in the Comments Section below. ECWID is an an e-commerce platform that helps you easily create an online store so you can sell products and services anywhere online or in-person. ECWID can be integrated in to your website, Facebook and other social media, and Marketplaces such as eBay. First sign in to your ECWID account or create a new account if you don’t have one already, at ECWID’s website. Once you have created your account or have signed in, you will be taken to your ECWID Control Panel. The Control Panel will guide you though the steps you need to complete the setup. If you are just starting a new account, select ‘Create account’ and complete the details required. Next select ‘Create Your Own Online Store’ where you will go through the steps required to create your own online presence. You will be asked the question ‘Do you have a Website or Facebook Page?’ Select the ‘Yes, I have a website’ option. On the next screen select ‘Other Platform’. You are now on the ‘Add ECWID store to your site’ screen. Highlight the code in the center of the screen and copy it to the clipboard. Now switch to EverWeb and go to your Storefront page. Add an HTML Snippet widget to the Storefront page and paste in the code that you copied from the clipboard into the HTML Code box. Click ‘Apply’ to finish. Now go back to the ECWID website and select ‘Proceed to next step’. Now you will need to add in the URL of your Storefront page in to the field on the ‘Set. Store URL’ page. If you have already published your website with the Storefront page, navigate to this page in your browser. Copy the URL address from the search bar in to the field. If you have not yet published your website you can come back to this step later once you have published. Alternatively, use the folder structure of your website from the Web Page List to construct the Storefront URL name. After adding the URL to the field in the ‘Set store URL’ page, click on the button ‘Proceed to next step’. You will be taken back to the Control Panel page as you have finished the setup. You should now go to the ‘Add Products’ section of the Control Panel and add one or more products to your ECWID store. If you have not added any products in your own store, ECWID will display a demo product list when you publish your website instead! Once you have added your product(s), complete your ECWID Control Panel setup so that your storefront is ready to go if you have not done so already. The last step is to go back to EverWeb and publish your website. When you view your Storefront page, you will see your products listed for sale! You can also follow the steps in this blog post in our YouTube video Using ECWID with EverWeb. If you have any questions about this blog please let us know in the Comments Section. We are always happy to help! On July 1, 2018 Google is set to release version 68 of its popular Chrome web browser. The new version of Chrome will mark all HTTP websites as ‘non secure’ in a move to make for a more secure Internet. This new security measure will affect all Chrome browser users. Websites using HTTPS are not affected as they are already secure through end to end data encrypted. In addition to Google’s new security measures in Chrome 68, the new version of the browser offers improved performance and other features not available for HTTP only websites. If you only have an HTTP website URL, your website will start to show warnings in both search results and when a visitor visits your website as of July 1, 2018. The warning will be displayed in the search path bar at the top of the web browser. If you have an HTTP only website URL, EverWeb has solutions to make your website secure! When someone visits your website the web address URL typically has a format such as http://www.yourdomain.com. HTTP stands for HyperText Transfer Protocol and is not a secure method of transmitting data from your visitors’ browser to the website server as data is not encrypted and can be seen by anyone who may be monitoring Internet traffic. HTTPS URL’s, however, use website addresses in a format of e.g. https://www.yourdomain.com. The ‘s’ at the end of ‘HTTPS’ stands for ‘Secure’. All data transferred is end to end encrypted from your visitors’ browser to your website server. No one can see or steal information between these two points. HTTPS, therefore, makes browsing much more secure and private. An HTTPS URL also protects your website from relatively common ‘man in the middle’ attacks where the internet connection is hijacked sending a visitor to a fake URL without the visitor realizing. HTTPS URLs after July 1, 2018, will not show Google Chrome’s and other web browsers warnings. For EverWeb+Hosting 10GB or Higher accounts, just go to File-> Edit Publishing Settings menu in your Project and select the ‘Use Secure HTTPS URLs’ option. Republish your website using the File-> Publish Entire Site menu option. There are no additional costs or set up required as EverWeb makes it easy with just a tick of a checkbox and a republish! If you have an EverWeb+Hosting 2GB account you just need to the ‘EverWeb Secure Shield’ add-on to your account. This will add the 256bit encrypted SSL certificate required to enable HTTPS on your website. Site Shield Addon can be purchased in your EverWeb Client Area. Once you have purchased Site Shield Addon, go to File-> Edit Publishing Settings menu in your Project and select the ‘Use Secure HTTPS URLs’ option. Republish your website using the File-> Publish Entire Site menu option. There is no additional set up required. If you are using EverWeb Standalone (Software Only) you will be hosting with your own third party web hosting provider. You can still use HTTPS URLs and EverWeb. However setting up HTTPS may be a bit more technically involved. Next, contact your web hosting provider and ask them to set up an SSL certificate for your site. Usually there will be an additional cost for providing this service. The last step is for your web hosting provider to work with you to you properly redirect your non-secure HTTP URLs to secure HTTPS URLs. One of the benefits of an EverWeb+Hosting account is that we are able to make the process of switching from a non-secure HTTP URL to a secure HTTPS UTL incredibly simple. All you need to do is click a checkbox and re-publish your site. 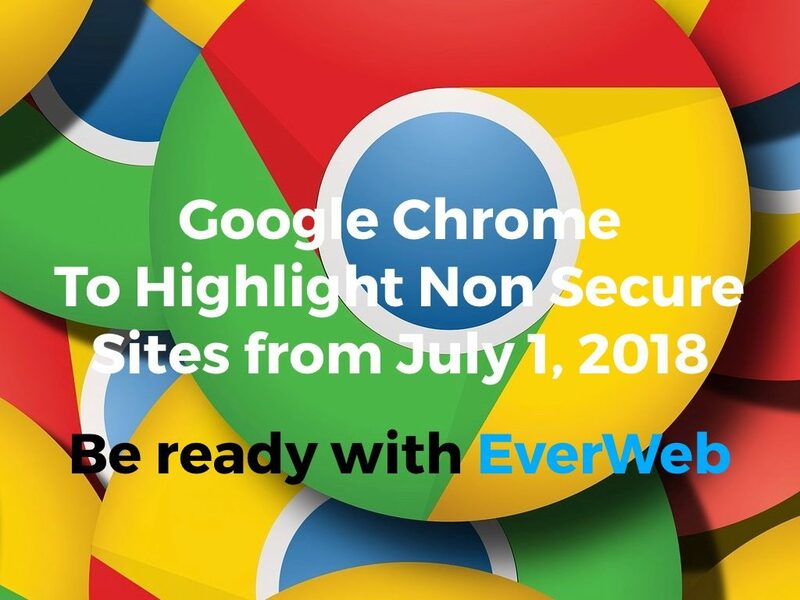 Watch our step by step video tutorial showing how to set up EverWeb Site Shield Addon with your website so that you are fully prepared for the new version of Google Chrome with your website secure in just a few minutes! Adobe recently announce the immediate discontinuation of their website building software Muse its the last feature update released on March 26th 2018. If you currently use Muse you will no doubt be considering alternative website building products before support for Muse ends in May 2019 [Updated: Support now ends on March 26th 2020]. 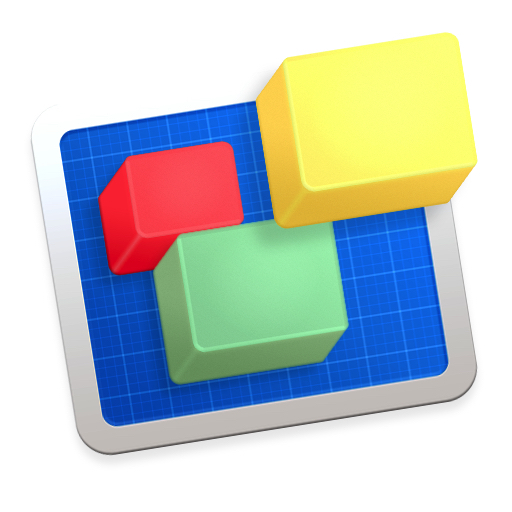 Ever web is a drag and drop website builder for the Mac. EverWeb is NOT sold as a subscription. You get to keep the version you purchase (plus any upgrades you are entitled to while your account is active) for life. You will never lose access to the software you purchased if you decide not to renew your plan. 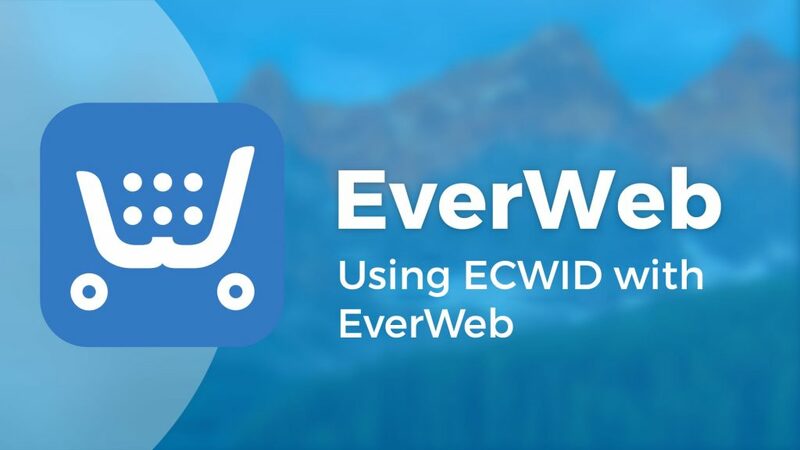 Follow the link for more information about purchasing EverWeb and FAQ’s. EverWeb is installed locally to your hard disk which has the advantage of no lag when developing your website. EverWeb is designed to be easy to use whilst making complex features simple to implement without having to resort to coding. You can use fully customizable Theme Templates to develop your site, or start with a blank template if you are redeveloping your existing site from scratch. We have already had many Muse users enquiring about EverWeb and how the two products compare. Whilst it is always difficult to directly compare products, the list below gives you some indication of the features that EverWeb and Muse have in common. Whilst no means an exhaustive list, these are some of the major features that EverWeb and Muse have in common. Inevitably there will be features that are in Muse that are not available in EverWeb, and vice versa. In such instances, there may be alternatives or workarounds available. Please refer to the ‘Resources to Help’ section below for help here. We also recommend downloading the free trial version of EverWeb so you can experiment to see what is possible. Drag and drop, no coding needed to build your website. Secure Websites Support Available with EverWeb+Hostng Accounts. EverWeb is free to try. You can download the trial version at the EverWeb website. The trial version is fully functional so you can develop your website immediately. The only restriction with the trial version is that you cannot publish to your local hard disk or to the Internet. EverWeb comes complete with built in help with a downloadable user manual and help videos throughout the product wherever you see the ‘?’ symbol displayed. There are plenty of resources to help you discover more about EverWeb. This blog has lots of information about EverWeb’s features and how to use them. There is also the EverWeb website itself which contains lots of information and video tutorials, our YouTube Channel and our Discussion Forum. If you have any questions about EverWeb, please let us know. We’re always happy to help. Since our last update at the end of 2016, we’ve been busy, as always, making EverWeb even better. Catch up on what you may have missed in our mid 2017 Review below! The last release of EverWeb in 2016 came in November with the huge version 2.0 release that added a fully featured, integrated, blogging environment to EverWeb. The all new Contact Form Advanced widget also debuted, taking contact form creation to a new level. 2017 kicked off with the release of EverWeb 2.1 in January, adding a new ‘Link to Archive’ feature for the blog main page as well as new security features for the Contact Form Advanced widget, more details of which can be found below. Other additions to the widget included the ability to delete form options and reorder control options. Two new keyboard shortcuts also debuted making your workflow a lot easier and time saving. The Command+Option key shortcut lets you easily drag an object out from underneath other objects whilst the Command+Shift key shortcut lets you to drag and drop objects up and down your page whilst retaining the page layout. For more details, follow the links to the EverWeb version 2.1 release notes. In February, EverWeb version 2.1.1 updated the Audio, Contact Form Advanced and Image Slider widgets as well as the usual maintenance and stability improvements. The EverWeb 2.1.1 release notes have all the details. EverWeb version 2.2 followed in April with the brand new Animation Engine bringing you 16 different types of animation effects to use in your website. This is a great feature that really makes any website pop and are great ‘Call To Actions’ for your visitors. The new ‘Distance to Object’ feature was also introduced, making it easy to see how far one object is away from other objects in the Editor Window. To use this feature, first select an object then hold down the Option key whilst mousing over other objects. You will see the distance between the source and target objects displayed directly in the Editor Window. For more on this and the other features of this release take a look at the EverWeb version 2.2 release notes. Our final release for the first half of the year, EverWeb version 2.3, brought optimization and speed improvements to make websites load faster as well as bringing faster upload times when publishing websites. There’s a lot of information available about EverWeb’s new blogging feature. If you are new to blogging, or transitioning from iWeb to EverWeb, our YouTube videos, and blog posts are there to help you get started. If there is something you want us to feature, please let us know, we would love to help! We also have an updated iWeb to EverWeb YouTube video for EverWeb version 2.o making transferring from iWeb to EverWeb even easier with our step by step guide. Since EverWeb 2.0 we have refined and added features to blogging such as updating the blog main widget to include a customizeable ‘Go To Archive’ page hyperlink feature and streamlining the import ofblog posts from iWeb and WordPress into EverWeb. The Contact Form Advanced widget added new features to make sending and receiving of forms more secure and reliable using SMTP features. This is an important addition to the widget as email apps get more aggressive about spam, you will still want ‘valid’ emails to come through without any problem. A couple of small, but great, additions to this widget. You can now center thumbnails and you can also change the color of the previous/next arrows to be either light or dark. One of first widgets that shipped with EverWeb 1.0 was updated to include audio looping, automatic playback on page loading, the ability to set the default sound volume and a mute option. 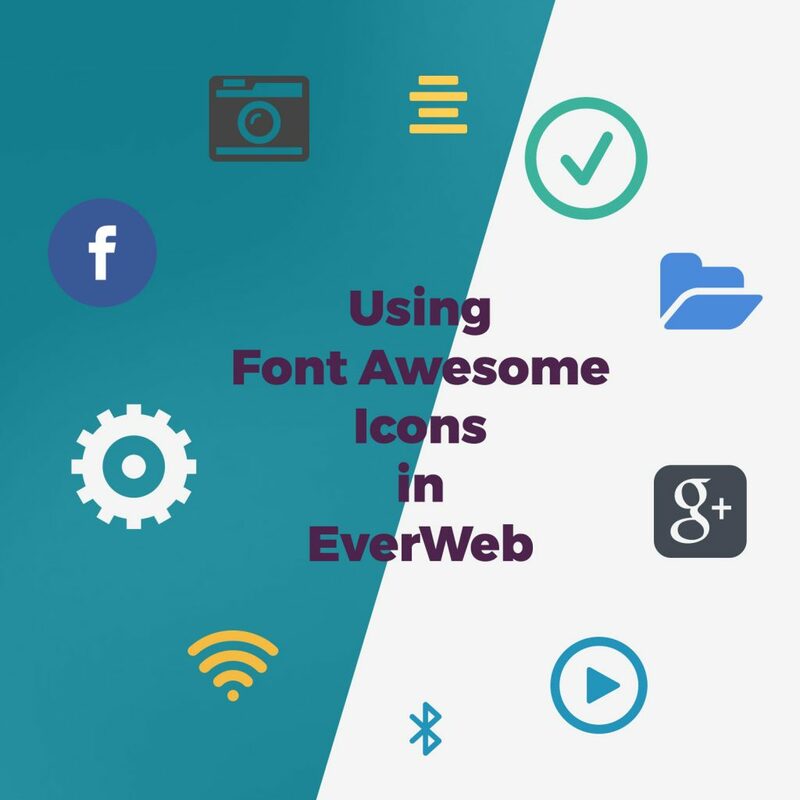 Our blog posts featured many different aspects of EverWeb but we also took the time to look at how EverWeb can be used with other products such as Font Awesome and JotForm. Our blogs also now have more links to corresponding YouTube videos so it’s even easier to see how features work. If there is any feature that you would like to see us cover, please let us know in the Comments Section below, we’re happy to help! Although it’s been a busy first half of 2017, there’s plenty more to come in the second half of the year. We’re working hard on EverWeb version 2.4 at the moment and should have more news to share with you soon! The most important part about EverWeb is giving you the best features and experience that we can. If there is anything that you would like us to consider for the future, or anything we can do better, please feel drop us a line I note Comments Section, we’re here for you! If you have not heard of Font Awesome, it’s a collection of over 600 scaleable icons that you can include in your web pages and it’s absolutely free! In addition, Font Awesome’s icons do not need to be downloaded and they can be updated by those who supply them. For example, Google updated its Google+ icon about a year ago and later updated its Font Awesome icon. The updated icon is automatically used in your web pages so you do not have to update. or republish. your website. The icons can be customized so that you can combine icons together, change the icon’s color and other effects. Last but not least, using Font Awesome’s icons is a great way to ‘dip you toes’ into the ‘waters’ of HTML. Go to the Font Awesome website and click on the ‘Getting Started’ menu. Sign up by entering your email address and clicking on the ‘Send my Font Awesome embed code’ button. Check your email. If you have not received an email, check your junk mail folder just in case. Copy the CDN (Content Delivery Network) embed code from the email to the clipboard. Go to the ‘Site Publishing Settings’ either by clicking on the website name in the Web Page List or by using the File-> Edit Publishing Settings menu. Go to the Header/Footer Code section. In the Header Code section, paste in the CDN embed code. You are now all set up to use Font Awesome icons in your Project. As you have added the code to the Project’s Header code section, the embed code is now available on all of your Project’s pages so you place add icons anywhere in your website. Now that everything is set up you can start to use Font Awesome icons. Each Font Awesome icon has its own name e,g. the Instagram icon is called ‘fa-instagram’, an icon representing a desktop pc is called ‘fa-desktop’ and so on.’fa’ is used as a prefix to identify the icon as a Font Awesome icon. All available icons and their names are listed on Font Awesome’s Icons page which is sorted by category and completely searchable. To get started, it’s a good idea to try out some examples from Font Awesome’s ‘Examples’ menu. You will find a great camera example in the ‘Larger Icons’ section which shows you how to scale the icon to different sizes, a ‘Stacked Icons’ section that shows you how you can place icons on top of one another and so forth. Even if you have never had any experience in HTML it is easy to get started using the code relating to each icon. Start with an example from Font Awesome’s icon page e.g. the camera in the ‘Larger Icons’ section. Copy the code that relates to the icon on the left hand side e.g. for the largest camera icon displayed, copy the code on the right of it to the clipboard e.g. Next, in EverWeb, drag and drop the HTML Snippet widget on to the page. Paste the code you have copied from the clipboard in to the the ‘HTML Code box’ of the widget and press ‘Apply’ to implement the code. The widget will update in the Editor Window. In this example above, the camera icon and the name of the icon (fa-5x) are displayed. If you do not want the text that is displayed, just delete the text ‘fa-5x’ from the end of the line of code and press the ‘Apply’ button again to update the widget. in the HTMLSnippet widget. Use the examples in Font Awesome’s website to experiment more, especially if you are new to coding. Use the examples to stack icons, create lists of icons, animate icons and so on. There is plenty to discover! You will usually see the results of your work immediately in EverWeb as the HTML Snippet widget updates when you press the ‘Apply’ button. The main source of help is the Font Awesome website itself. It has many examples and a blog where you can find out more information, hints and tips on using these icons. As Font Awesome involves some coding, the W3Schools website may also be of use as it has a specific section dedicated to Font Awesome as well as further examples and information on how to start with HTML if you are interested. Enjoy discovering Font Awesome in EverWeb! Justified Text in EverWeb? Yes You Can! Justified text is used extensively in printed books and newspapers as it’s flush left and right margins give content a clean, well ordered appearance. 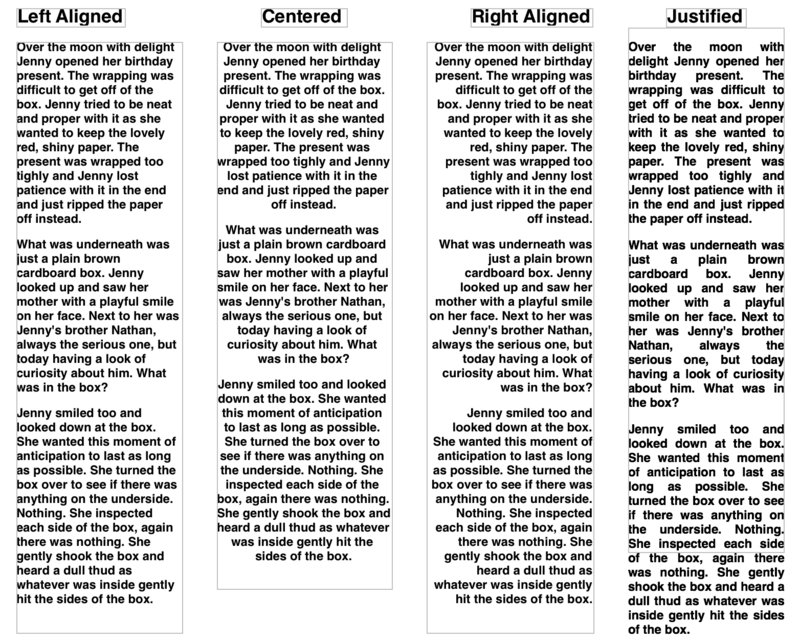 Broadsheet newspapers traditionally used this style of alignment to place as much text content within a limited amount of page space. Many print edition newspapers today mix justified and left aligned text for both styling and readability reasons. Printed books and academia also use justified text, printed books for much the same reasons as newspapers. Academic works tend to use justified text where annotations or corrections need to be applied to text. Often specific rules about content layout are required, e.g. university dissertations often require justified text with double line spacing as it’s easier for assessors to annotate and mark the content this way. In the Internet Age there’s often argument that justified text has no place in the digital media and with good reason. Whilst it looks neat and tidy in print, on screen it can result in large gaps between words (see the screenshot below for an example of this.) These gaps can form ‘rivers’ of white space flowing down a column of justified text making distracting the reader and at worse making the text just difficult. There’s also a tendency for the right margin to be ‘over hyphenated’ to accommodate words having to be split from one line to the next to accommodate the justified text look. Again this can result in readability issues. Studies indicate that justified text slows reading speed as the eye tends to track words and lines better when the right margin (in the Western World) is ragged rather than justified. Those who have reading disabilities also have more problems with justified text than with left aligned, ragged right text. Comparison of left, centered, right and justified text. As can be seen, the justified text tends to result in large gaps between words creating rivers of white space in the column on the right. Printed text solves the problems inherent with justified text through subtle changes of font size, spacing and other styling attributes to make text visually appealing. In the digital world, the tools available are generally not sophisticated enough to make justified text look as appealing as printed text. As such, in most cases text manipulation is the digital world is limited in scope which is where the typesetters eye is an advantage. HTML 5 and CSS offer limited support for justified text basically for the same reasons. As EverWeb complies with the standards set for HTML5 it therefore includes left aligned, right aligned and centered text options but not justified text. Lastly, the Internet has expanded our concept of what a page is. When designing a website you have an unlimited “canvas” to use. Pages have no limits. As such, some of the original reasons for using justified text are no longer necessary. You don’t need to cram content any more in to limited space. Even with all of the problems, justified text can create a neat and organized appearance to text and IS a great way to highlight particular areas of text. To create your own justified text in EverWeb just download the free Justified Text widget from EverWeb’s Third Party Add-Ons section or directly from AllAboutiWeb.com. The AllAboutiWeb website explains how to download and install the Widget. Once installed you will see a message that the widget has been installed. When you launch EverWeb, you will see it in the Widgets Tab. The widget works in the same way as all of EverWeb’s widgets, just drag and drop it to where you want it on the page. The Justified Text Widget lets you create up to three paragraphs. If you need more paragraphs just drag and drop another Justified Text Widget on to the page! You can style the text using the Fonts Panel to create the effect you want. The Justified Text Widget from AllAboutiWeb.com gives you extra flexibility in your website design. Whilst it can give your web page a neat and tidy look, always remember to prioritize the readability of your website’s text content over it’s aesthetics. What do you think of justified text? Does it have a place in website design today? Let us know your thoughts below! Although WebCrusher lets you publish your website directly to your FTP server some users want to use their own FTP client. If you like using an FTP client for publishing your website, you still have that option after you have run your site through WebCrusher. Follow the instructions in the video tutorial to learn how. To publish your WebCrusher optimized site using a third-party FTP client, follow these simple steps. First, locate your optimized website folder by clicking Export, and selecting the Open Enclosing Folder tab. Then press the Next button, and your optimized website folder should appear in the Finder window. Open your FTP client. For this demonstration, I am using CyberDuck which is a free FTP client which you can download from cyberduck.ch or the Mac App Store. Once your FTP login information has been entered, and you’ve connected to your server, locate the directory on your server that your website is associated with… and then drag and drop the optimized website folder into that directory. When your site has finished uploading, you can visit it and view the source code to make sure it has published correctly. If your code looks tightly squeezed together like you see here, then you have published it properly. Adding Google Analyitcs and Statcounter codes to your Sandvox websites is very easy to do, but can be very frustrating if not added correctly. In this tutorial, we are going to quickly add both statistical trackers to our Sandvox websites. The first code we will be adding is for Google Analytics. If you are unsure of what Google Analytics is and want to learn more, you can read up more about it on the Analytics website. In the meantime, here is a demonstration on how to add the code to your website. Open up your web browser to www.google.com/analytics. If you do not have a Google account, you will need to click on the Sign up Now button. Otherwise, click on the Access Analytics button and login using your Google ID and password. Assuming this is your first time signing up for Google Analytics, you will need to click the Sign up button, located in the bottom left corner of the analytics page. On the next page, you will need to enter your websites URL. You will also need to name the account. This name can be whatever you want it to be or you can simply leave it as your URL. Then select your country, and time zone, and hit the continue button. Fill out the remaining information required when signing up. The final stage will ask you what you are tracking, which most of you can leave as A single domain. Finally, you will be told to paste a certain code on your site. Highlight that code and copy it by holding command and c or by going to Edit, and selecting Copy. Head back to Sandvox, and in the menu bar, press Site, and then select Site Code Injection. Make sure that the Head Area tab is selected, and paste the code you just copied into the second of the two text fields. Your Google Analytics code will now be applied to all pages on your website. Now I’m going to show you a very similar process, but this time we will be adding a Statcounter.com code. The first thing we will do, is open up our browser to www.statcounter.com. If you do not have an account with statcounter, click on the register button on the top left part of the navigation menu. Fill out all the required information and register your account. After you have registered, login with your username and password. Once you are logged in, you will need to create a new project in order to get your code. Click on the Add New Project button. In the following form, you will need to enter a title for your website, your website URL, a category for your website, and your time zone. You also have the option of having the statcounter not count your visits to the site by blocking your IP. If you don’t care for this feature, just leave it blank. After you click the “Next” button, you will then need to click on the Configure and Install Code button. You have a few options for which type of statcounter you want. It is recommend that you use the Invisible statcounter, that way, you are the only one who knows how many hits your site gets. Then click on the next button. Make sure that Default Installation Guide is selected from the drop down menu. Then press the Next button. Now we are given our Statcounter code. Again, we must highlight this code, and copy it. Back in Sandvox, we must have our Site Code Injection window opened again. This time, make sure the Document Body tab is highlighted. Once again, we are going to paste the code we just copied in the second of the two text fields. When you publish your site, the Statcounter and Google Analytics codes will be applied to every page on your Sandvox website, and you will now be able to track your website visitors. Since many blogs and forums are open source, malicious users have full access to the source code and can find vulnerabilities or take advantage of how a system works in order to gain access to protected pages on your site, spam your site, or use your site to help get your visitors to their site. This is very important to keep track of because if your site has been hacked Google will either remove your website completely from their search index or warn users every time they click your site in their search results. This can dramatically affect your reputation and prevent users from visiting your site. A Google Webmaster Tools account is free to set up. You should submit your XML Sitemap file in order to get your website listed in Google and help Google’s crawler access the important pages on your website.